SCOTLAND’S Homecoming year will officially start this weekend with a series of high-profile celebrations to mark the 250th anniversary of the birth of our national poet Robert Burns. Events are planned in Ayrshire, Dumfries & Galloway, Glasgow and Edinburgh, and people around the world are invited to help kick off the celebrations with their own Burns Supper and be part of the World Famous Burns Supper Celebration, a partnership with The Famous Grouse. Many of the events are already sold out, with event organisers reporting great interest from Scots as well as visitors from the rest of the UK, Europe, North America and further afield. Over the weekend of 23-25 January events are planned throughout Scotland kicking off a 10-month long national programme featuring more than 300 inspirational events that connect with the year’s themes of Burns, golf, whisky, great Scottish minds and innovations and ancestry. Spanning the length and breadth of the country the programme of events has been created to encourage Scots, people with Scots ancestry and those who simply love Scotland to ‘come home’ and celebrate in 2009. Key events will take place in Alloway, the birthplace of Robert Burns. Iconic Burns, will see the village becoming a focal point for the Burns celebration on Saturday 24 January. 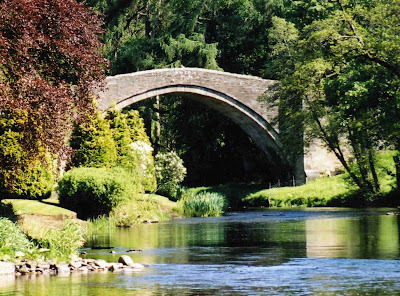 Village locations, including Burns Birthplace Cottage and the Brig O’ Doon (pictured above), both owned by the National Trust for Scotland, will be brought to life in a one-off extravaganza to mark the start of this unique year of celebration. Interest in the event has been huge, with over 3,000 people from the UK and around the world entering the ballot for 1,000 tickets. Over 2,700 Burns suppers around the world have already been registered on the site, from the top of Canada’s CN Tower to the top of Ben Nevis. In Dumfries up to 10,000 people are also expected to take to the streets, where Burns spent the latter part of his life, for Burns Light on Sunday 25 January. The entire region has been mobilised in support of the event with more than 3000 lanterns featuring in four processions on Burns Night. Preparing for the event, 92 community workshops have been held throughout Dumfries and Galloway, involving youth groups, church groups and after school clubs. Forty-two schools are taking part in this free, non-ticketed event and whole villages have chartered buses to bring families and school children to Dumfries for this unique celebration. This Is Who We Are launches in Mid Steeple in Dumfries on Sunday 25 January. This exhibition celebrates the cultural and historic links between Scotland and Canada through digital photography. Photographs taken by affinity Scots in Canada will tell the story of their communities and demonstrate the strong influence of Scots when they travelled and named 1000 Canadian towns after their homeland. In Glasgow, Celtic Connections, Europe’s most popular winter music festival, offers its biggest ever celebration of Burns with a specially extended Homecoming programme. The festival boasts its most international programme to date, and so far there has been an increase in bookings from Australia, Africa and Asia and many of the events have sold out. Both dates of Transatlantic Sessions have sold out, and to meet demand another performance of Eddi Reader Sings the Songs of Burns took place after her first show sold out. Auld Lang Syne at the Glasgow Royal Concert Hall has standing tickets only left and all ‘dancing’ tickets for the Homecoming Scotland All-Star Ceilidh have been sold. Those who have missed out on tickets for some of the sold out events will still be able to join the celebrations by attending the Jamaican Burns Night featuring Sly and Robbie at the Old Fruitmarket or by dropping in to the free 12 Hour Burns Concert on 24 January at The Glasgow Royal Concert Hall. Elsewhere in Glasgow, Burns Illuminated, the Bard’s story told in sound and light will be projected onto Glasgow City Chambers between 23-25 and on Sunday all the family can join a free musical celebration featuring the Red Hot Chilli Pipers and the premiere of the Royal Scottish Country Dance Society’s Homecoming Dance in Glasgow’s George Square. In Edinburgh there’s a final chance to see Zig Zag: The Paths of Robert Burns at the National Library of Scotland before it goes on tour across Scotland. This major exhibition, which has received record visitor numbers, combines pictures, sound and the poet’s own words to show how Burns consciously created his own myth. On Saturday 24 January visitors to the exhibition will also be able to mingle with the witches and warlocks of ‘Tam O’Shanter’. On Sunday 25 January the National Museums of Scotland mark the start of their programme of Homecoming events with an exciting line up of poetry, performers, art and music to celebrate Scotland's most famous bard, Robert Burns. From 22 January The Scottish Parliament hosts As Others See Us – a photographic exhibition showcasing unique and engaging contemporary portraits of twenty of Scotland's best-known figures alongside their favourite pieces of poetry and songs by Robert Burns, whose work continues to inspire today. The Scottish Storytelling Centre hosts events for all ages to celebrate the language and legacy of Robert Burns, from nursery songs to poetic epics. Marie Christie, Director of Homecoming Scotland 2009 said: “We have been delighted with the response to the launch weekend events. Homecoming is about creating a real sense of celebration in Scotland and inviting the world to share it with us. The fantastic community response to the events in Alloway and Dumfries, sold out events at Celtic Connections, increasing visitor numbers at the Burns exhibition in Edinburgh and thousands of Burns suppers linking up around the world for the World Famous Burns Supper are all testament to the interest and enthusiasm for Burns and this unique celebration. There are currently 441 Ayrshire business stories permanently archived on this site. To locate those of most interest to you, please use the site search facility in the top left hand corner of this page. Type your search term in the white box, then click “SEARCH BLOG”.